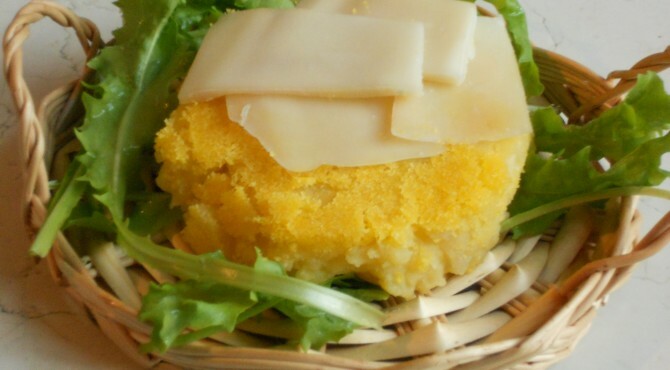 patate | CUCINA ITALIANA – ITALIAN FOOD | Il cibo con il sole dentro – With the sun inside! Boil the potatoes halfway. Cut into two parts and dig the flesh. Sauté the finely chopped shallots in a pan with extra virgin olive oil, pour in white wine and add the cauliflower cut into small pieces. Put milk and water while cooking if needed. At the end of cooking, add the pulp of potatoes, season with salt ,pepper and chives. 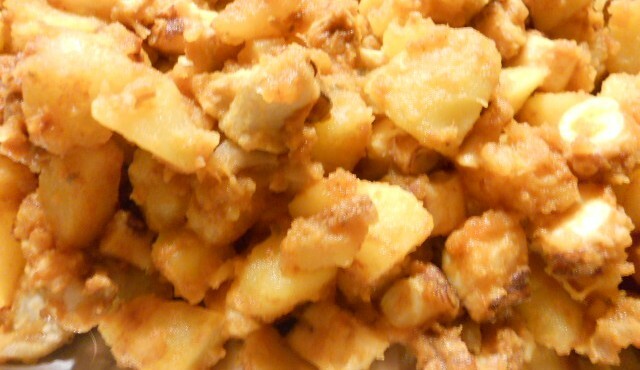 Knead the mixture coarsely with a fork, and fill the half potatoes. Before re-pair the two halves put a teaspoon of blue cheese in the center. 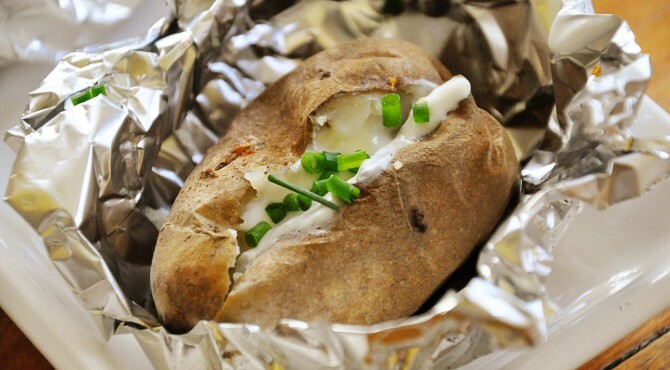 Wrap potatoes in aluminum foil and put them in a very hot oven before serving: must arrive at the table “hot”! 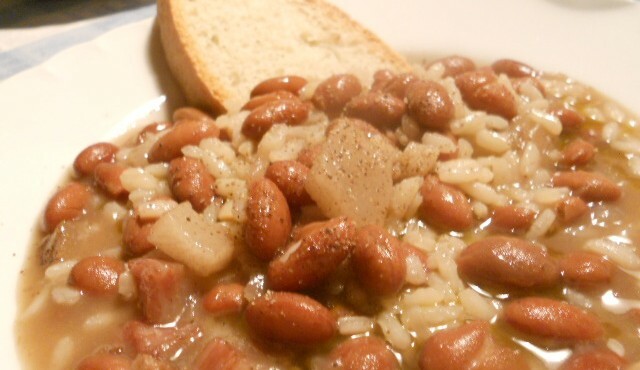 Keep 12 hours to soak dried beans and then cook in salted water for 40 minutes. If you use fresh ones you do not need this. Sauté the onion in oil, with the carrot and the ’garlic, add the bacon cut into small cubes and fry. Pour the white wine, add diced potatoes, a tablespoon of tomato puree and cook with plenty of broth for about 30 minutes. At this point add the beans with more broth, and rice. Take the time to cook the rice. Season with salt and serve with a drizzle of olive oil and a sprinkling of black pepper. Boil the potatoes and cut into slices and put salt on it. Cut the cabbage into thin strips blanch in boiling water for 5 minutes. Drain and mash in a pan with olive oil and shallots for 5minutes, seasoning with salt. Butter the ramekins and pass the breadcrumbs on it. Put a layer of cabbage, a layer of potatoes, a layer of blue cheese and a sprinkling of ground almonds, until completion of the stencil. Bake at 200 degrees for 15 minutes. Nadia prepared this delicious Galician octopus, with a fairy dust that brought from Spain, consisting of paprika, chili and other ingredients that give it a wonderful smoky taste! Boil the octopus and cut into small pieces. Boil the potatoes and cut into cubes. 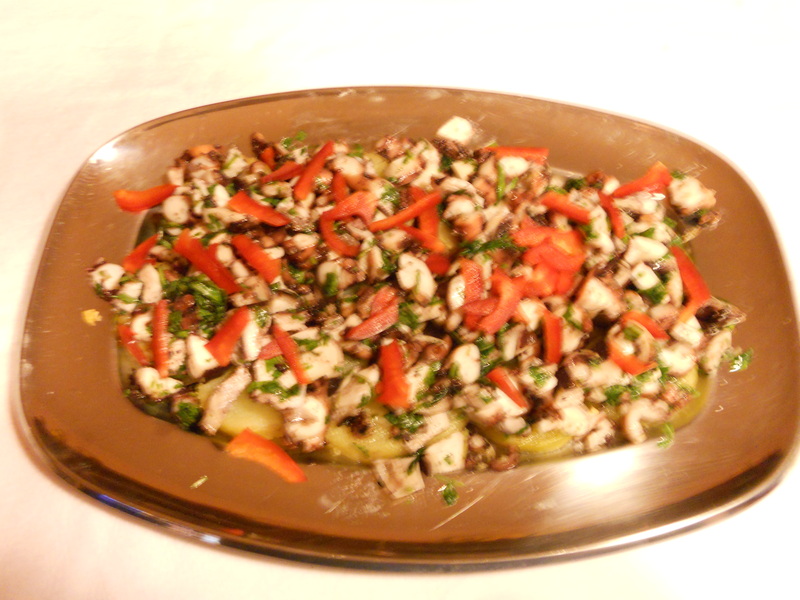 Mix octopus and potatoes and season with marine salt, olive oil and plenty of ”fairy dust”: very good, good Nadia! Good and easy: boil the potatoes halfway, cut them into slices about 3-4 cm. and fry in oil until golden brown. In oven grill cook the pepper and peel it when cooked, season with oil, salt, chives, and cut into stripes. Dip the shrimp in cornmeal and fry in oil. 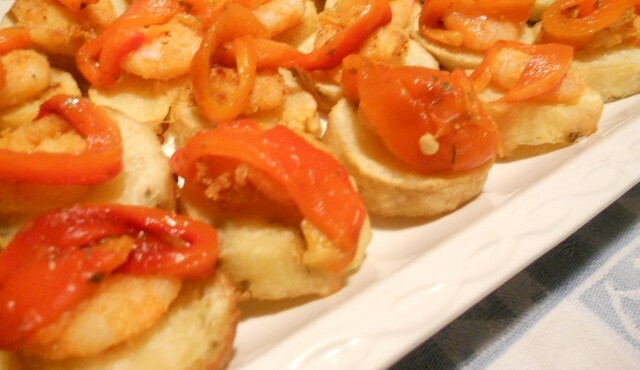 Now put over each slice of potato a fried shrimp and a fillet of red pepper. Cut the leeks into slices and diced potatoes. Sauté in a pan with a curl of butter. After about 5 minutes of cooking, add water and broth, season with salt and cook for about 45 minutes. I really like vegetables, and autumn’ vegetables in particular, and so I will begin to eat and then cook them, and consequently I will show to you! The first Broccoli rabe, are not very bitter, because (as they said our old people) have not taken the “freeze” yet , but they are delicious. After carefully washed broccoli, boil them in water for 10 minutes. Drain and squeeze out the water. Sautè in a pan with olive oil, pepper and salt. In the meanwhile boil the potatoes until cooked. Oil a baking molds and put the three ingredients in layers. Bake at 180 degrees for 15 minutes. Serve warm with bresaola with lemon dressing. 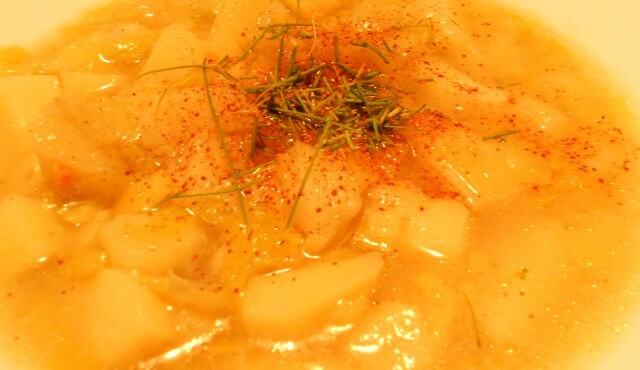 Wash the potatoes and cut, with skin, into slices of 2 cm. 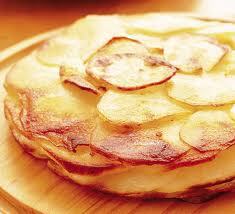 In a pan with olive oil and fry the slices of potatoes, 5 minutes per side. Cut the tomatoes into slices and let them dry in a pan for a few minutes, add salt and pepper. Cut the onions into rings and cook in white wine for 5-7 minutes. Now you can make the pie by putting a potato slice, a tomato, some onion rings, a sprinkling of oregano. 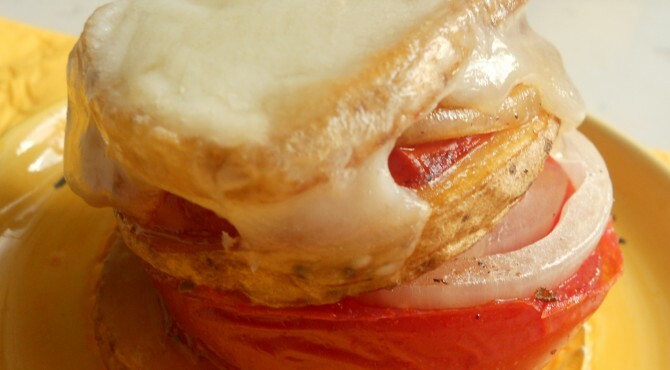 Fix it with a toothpick and bake in oven at 180 degrees for 20 minutes, add the smoked cheese into thin slices only in the last minutes of cooking. Boil the potatoes in hot salted water. When ready peel it and mash, add eggs, salt and pepper. Put some oil in the molds and sprinkle with bread crumbs. Put the puree into molds and bake at 180 degrees for about 20 minutes. When they overturned, still hot, grate over the fontina cheese. Ieri sera, a casa di Nadia, abbiamo cucinato TANTO pesce! 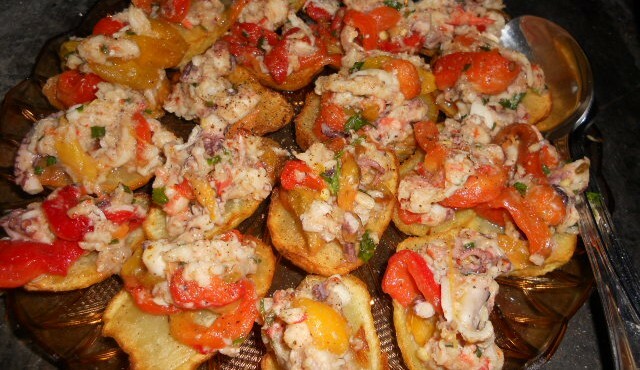 Abbiamo cominciato con Crostini di patate con insalata di polipo. 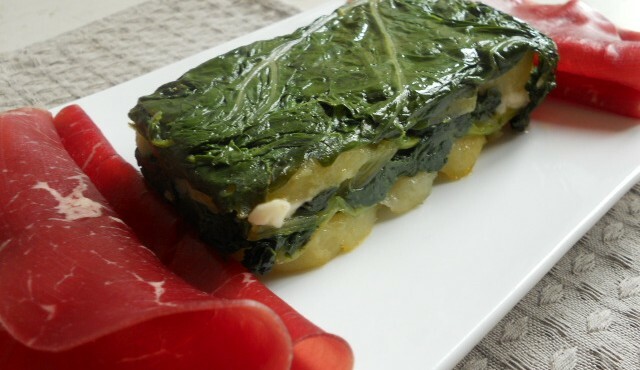 Facciamo bollire in acqua le patate ( con la buccia) e portiamole a metà cottura. Quando sono cotte tagliamole a fette alte circa 1 cm e lasciamole freddare. Facciamo bollire il polipo in abbondante acqua ( con un pizzico di sale) per circa 40 minuti. Quando è tenero ( testiamolo con una forchetta) scoliamo e tagliamo a pezzetti piccoli piccoli. A questo punto condiamolo con il succo di mezza arancia e di mezzo liomne, l’aglio passato allo schiaccia aglio, la rucola, aggiustiamo di sale e peperoncino. Friggiamo le fette di patate in olio bollente fino alla doratura. Serviamo l’insalata di polipo sopra alle fette di patate.